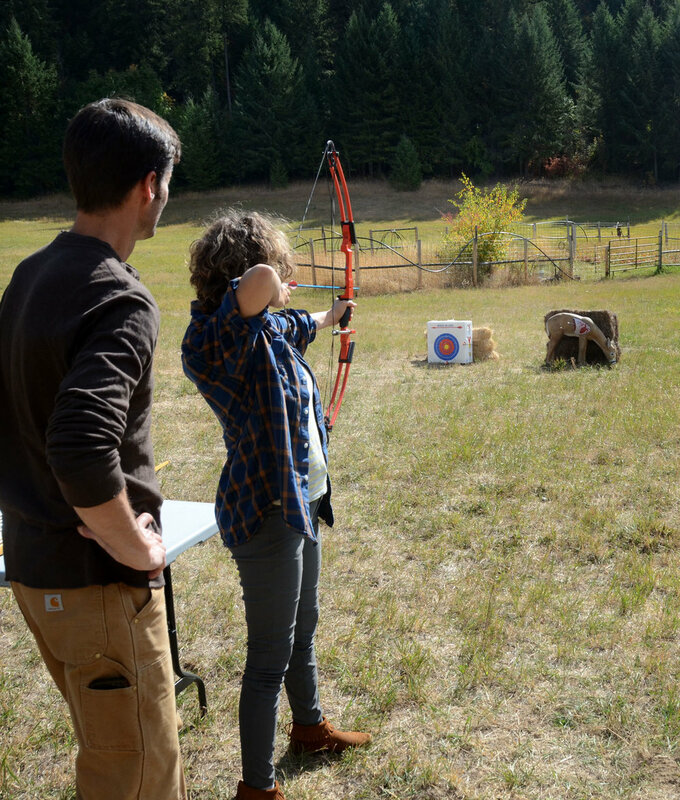 The 4-day Awaken the Hunter course was pivotal to my moving forward with the decision to hunt. Before signing up for the course, I had been wrestling with perceptions I’d had of hunting culture, was struggling with being mentored by a partner who had been hunting his whole life and didn’t know how to teach another adult to hunt, and was concerned about my physical abilities to navigate through difficult terrain. There was so much I needed to learn and I was feeling overwhelmed and intimidated. The course broke down the hunting experience into clear and manageable parts addressing everything from hard skills and safe practices to hunting culture norms and rules and regulations. I found Bruce’s style of passing on hunting knowledge to be very thoughtful and supportive of the individual learner. The conversations with Bruce and other HNHS students helped to integrate conflicting thoughts and values and convinced me that hunting was well aligned with my integrity and the vision I had for a healthy lifestyle. It also occurred to me that, in these times, our society needs to see examples that contradict stereotypes. Maybe a few more female, progressive, environmentalists with fishing and hunting skills would be good for us. Since the course I’ve been deer hunting each year and have salvaged deer using the new WA law that came into force in 2016. In the fall of 2018 I bought a left handed lightweight hunting rifle, a big game combination license, and access to timber properties near Forks on the Olympic Peninsula in preparation for the opening of Elk hunting season. Elk hunting was as harrowing as I thought it might be and I was thankful to have the leadership and support of an experienced hunter and the skills gained at the course and over the last few years hunting deer. The hunt included so much responsibility — especially weighty was maximizing the value of the harvest. It’s a responsibility I’ll be continuing to carry (and enjoy) until the last piece of elk meat is unwrapped from butcher paper. I can't say enough good things about Bruce and Human Nature Hunting. I came into the class with zero hunting experience, but after spending 4 days with Bruce I felt confident enough to venture into the woods in search of game. Bruce brings together the things about hunting I feel are difficult to approach, like gutting, skinning and butchering, tracking game in the field, and even the complex rules and regulations surrounding hunting. His approach is extremely respectful of our natural world and the animals we hunt, which isn't something I ever expected when I thought about a "hunting class." Bruce certainly helped change my opinion of hunters in general and I gained a tremendous amount of respect for him and his colleagues. It really was transformative for me and I'm so happy I did it. Human Nature Hunting has a good thing going. Awaken the Hunter. When it comes to awakening the hunter in children, we adults are a lot more anxious than we should be (as we are these days about most things related to our kids!). Your program reminded me that what we fear might shock, concern or sadden our children, are in fact inherent aspects of life, death and nature -- for which children have an intuitive understanding. Therefore, they embrace your teaching wholeheartedly, with a spirit that our "civilized" culture usually stamps out of us by the time we are adults. I was particularly pleased that my son received a holistic introduction to hunting in a family atmosphere -- and that your program included everything from knife sharpening, animal processing, map reading and firearm safety. I will recommended it highly to family and friends. We would return again without a second thought! My teenage son and I had the pleasure of joining Bruce for a private hunting course. Bruce is passionate about his craft and a consummate professional, approaching hunting with a deep respect for its history and tradition. He patiently and painstakingly shared his knowledge and enthusiasm for hunting with us. It was an ideal opportunity to immerse ourselves in this journey both practically and philosophically. From the smells and sounds of butchering the lamb, and feelings of being out West in the woods and mountains, to the views from the porch and the tastes of the gourmet food, it was a unique combination of experiences tied together tastefully and holistically. We would highly recommend anyone interested in developing a firm foundation in big game hunting to consider working with Bruce. My son, Parker and I both had an extremely memorable time with you and would definitely do it again and recommend your school to others. The time we spent together actually changed me, Bruce, and it is difficult to explain. Our time together realigned my soul and shifted my priorities, almost as though a window opened inside me that I did not know existed. It all started on a trip to Alaska this summer, which is how I found out about you and your school. Hunting was always a mystery that I felt I would never be able to learn about not having been taught as a child. You made it accessible and highly educational, creating a confidence in me that I thought I would never get. My 12-year-old son has ADHD and took to your training better than I ever thought. You showed patience with him that made his time something he will talk about for a long time to come. I’m a yogi and mostly vegan, and many of my vacations are spiritual retreats in India. Never did I think I would attend a hunting school and actually be totally open to hunting as a way of life and source for food. The meat one hunts for simply cannot be compared to the meat one purchases, however conscious that meat is. Furthermore I will go so far as to say that eating wild meat can actually be compared to the vegan lifestyle to which I am accustomed. You presented hunting not as a sport but as a way of tuning in and connecting to the natural environment, living in harmony with nature. One story you told really framed your approach, how you talked about traipsing around in the woods for hours through the snow enduring all sorts of physical hardships when finally you came upon a buck. You got it in your sights and were about to pull the trigger when something didn’t feel right…so you let it go. That story made me realize what a sacred act hunting can be. I also appreciate how you taught us to use all parts of the animal and waste nothing. Please let me know when the next class is, and this time I want to bring both of my kids. Ps. Taus is a culinary God, and having that level of food set you apart and in a league of your own. The food was better than available in most restaurants, and to have that level of food out in the wild is simply epic! What an experience this was. First, the practical. We sighted in rifles and practiced marksmanship. We walked through the woods simulating the pace of a hunt and looking for animal signs, and later, practiced following a blood trail. We gutted, skinned, and butchered an animal. This is largely what I had expected of the course, and it delivered. Bruce is a fount of knowledge and an exceptionally careful and patient teacher. On these points alone, I would recommend this course to anyone with an interest, or even a curiosity, in big game hunting. But the course went far beyond the practical. I read once, somewhere (the source eludes me), that an anthropologist had classified hunters as one of the most closed social groups in America. By and large, hunting is inherited, leaving those of us who are not from hunting families or communities with few points of entry. With this school, Bruce and John open a door that is usually closed to those of us who, like myself, did not grow up hunting. They do this by literally opening the door of their home and inviting people in. We shot targets and butchered meat and studied maps, but we also sat on the porch and around the dinner table and talked. Bruce and John and their fantastically knowledgeable guest speakers chatted and told stories. They talked about the nuts and bolts of hunting, yes, but also about the ethics, and the emotion: what it means to kill something, how it feels, and how to regard those feelings. How do you relate to other living things, and to death itself, including your own? What does it mean to be a carnivore at this point in history, and how do we make the decision to be one? While more esoteric than the skills portion of the course, these hours of stories and discussions were more valuable than I can express. Through their stories, Bruce and John were bringing strangers into a rich and heretofore mysterious world. I found it to be an act of deep generosity and love, and for that I thank them. The effect this experience had on me was profound. It gave me the confidence to go out deer hunting a few times in October. While there were no shots taken, every day felt like a success in its own way. I found it to be a wonderful new way to be outside, and to explore my backyard, and I'm excited to keep learning. Since completing your course, I have been dreaming about hunting and my time at your place, which is an endorsement for how it touched me even if I don’t yet have the words for it fully… When I started surfing (which changed my life!) I often dreamed of surfing (still do) so it says a lot about how you and the course touched me. I’d love to do your spring course as well schedule permitting. The setting at the cabin was spectacular. The cuisine, I won’t call it just food, was superb. I particularly enjoyed the expert guest instructors. They were very thorough in their fields and friendly and open in their instruction. I also enjoyed the camaraderie of the other guests. They were all thoughtful and considerate, free with their experiences and willing to share. Most of all, I really enjoyed the hands-on instruction in field dressing game. Just what I was looking for! Overall a wonderful experience. The spring course gave me everything I needed to launch into big game hunting this fall. Bruce and his staff explained how to find game, where to find the rules of the hunt, what to consider when selecting a rifle and ammunition, and how to field dress, quarter and butcher an animal. With that foundation, I was able to purchase and practice with a rifle, find a place to hunt, pack for a successful backpack hunt, and spend 3 days in the high alpine wilderness pursuing a deer. My favorite part of the course was the camaraderie of the group. That process started with the individuals who chose to attend. Everyone was interested in hunting as a way to connect with nature, and with our own human nature. And then undertaking the adventure of learning about (or teaching) hunting skills built camaraderie among the group. The most memorable part of the course was the food--the sights, smells and flavors. The front shoulder roasted in the net was a novel and very cool way to use a part that rarely gets eaten. I won't forget the sight of locally foraged greens and seared elk steaks all served on cast iron pans on the Coleman stove. The aha moment: Visiting with the WDFW biologist and learning that they are willing and able to share information with individuals. Hunting can seem like a deeply mysterious and intimidating process. I had always wanted to learn the ins and outs of it, but without growing up in a hunting family I had very few places to turn. Bruce and his co-instructors at HNHS did a masterful job of demystifying the hunt while also capturing the primal timelessness of why we do it. Our course included in-depth conversations on hunting ethics and wildlife conservation without skimping on the tactical details of how to execute a successful hunting trip from beginning to end. Field dressing really stuck with me the most. This is probably because it's the most intimidating and mystifying part of the experience for me, and it naturally brings out some very primal feelings in the process. I feel a million times more capable and comfortable with the entire hunting process simply as a result of learning this skill set alone. I cannot recommend this course enough. I've been trying to find something like it for ages, and Bruce has managed to craft his knowledge into the perfect offering. With his help, I've gained a lifelong hobby and taken the first steps toward reconnecting with the ecosystem I live in. I have been looking for a way to get in touch with nature and learn how to successfully and safely learn about hunting. Having not grown up hunting, the idea of just going out into the woods with a deer tag didn't sit well with me. Also, I very much wanted to learn while having my daughter be a part of this journey. And no, I wasn't looking to just go shoot a trophy deer on a guided trip. I learned about the HNHS by way of the staff at Outdoor Emporium. One of the guys spoke very highly of the McGlenn family. So I did my research and spoke with Bruce numerous times. It is a huge step driving someplace you have never been with your child to learn about hunting! Bruce answered all of my questions and engaged me on what I was looking to learn. That was enough to get my daughter and me enrolled. The experience that we had in Kettle Falls has created some incredible memories for Rachel and me. In fact, my Father's Day gift this year was a book that Rachel created (with Mom's help) detailing our time there and what we learned. We both came away with some incredible new skills. The detailed portion on processing your animal was amazing and literally a start to finish task. I now understand the preparation needed for what happens after you make the kill. Rachel did struggle at first with the idea of killing in order to get meat. I am glad she did and understood that connection between "Life" and what we put into our bodies and how that meat sustains us. This is something that our culture has lost certainly with regard to food being so readily available at the grocery store. The beauty of this process was that Rachel came to it in her time through the help of those at the school, without being forced. Having made that decision then to join in she readily went to work with processing and by the end couldn't wait to get to the grinder with the meat. I simply can't say enough about Bruce and the school (concept) that he is offering to his students at his cabin. There is NO ONE doing what the HNHS is doing with regard to hunt tactics, hunt preparation, overall safety, processing, etc. with such passion and humility. This is one of those experiences that you will never forget and to be able to include your child in that process is amazing. This school is geared so well to children because it is indeed more of an outdoor skills school. By going out into the forest and foraging for your vegetables/roots and breaking down your own meat, you have the satisfaction of knowing that you can feed yourself in healthy ways. I had a life-changing time participating in Awakening the Hunter. I can't more highly recommend this experience, especially for those who wish to explore their relationship with the hunt, nature and themselves. Words can't do justice to this amazing and transformative experience, and I greatly look forward to attending their future offerings. Much gratitude for all who make this possible. As an aspiring new hunter in 2007, I met Bruce McGlenn who shared his multi-skilled approach to the craft and passion of hunting big game, his stories of physically challenging pursuits and his unwavering commitment to teach others to embrace the value of our outdoor experiences. Just hearing the level of effort to prepare, encouraging safe marksmanship skills by practice and the reality of earning that notch in a game tag through personal responsibility jutted me forward in annual pursuit. I often enjoy the feeling of pride that comes from a resurging confidence now that I have experienced the reward of tucking that sacred, red meat into my own freezer by a well-placed shot – the capstone to a thoughtful and engaged pursuit in the wild. I never thought I’d get the opportunity to delve into the life of a hunter before this course. You really demystified the whole process, and it gave me a better idea of what I'm ready to take on and how I'd like to restructure my life. I have met hunters, and heard conversations in passing, but this was the first chance I’ve had to see the reasoning and passion behind the choices and decisions made based on ethics. Having spent a good part of my life adhering to a vegetarian diet, I never imagined myself rolling up my sleeves and processing a deer until you thoughtfully presented me and the others the opportunity. I also don’t think I’ll go back to ever seeing homemade meals quite the same either. :) You’ve convinced me through my stomach that this is really worth it. I strongly recommend this program to anyone interested in hunting as a conscious practice. I learned a lot about all aspects of hunting from start to finish, and I have a much better sense of how the practical aspects of hunting are entwined with ethical, spiritual, and global issues. Bruce is an excellent instructor and he's put together a strong supporting cast of kind, patient, and experienced guides. To top it all off, the food was great, I had a lot of fun, and made some new friends in the process. Alex and I had a great time learning and hunting with Bruce. We were almost complete newbies when we headed out with him to his hunting grounds, and we left at the end of the day with the knowledge of how to set decoys, clean ducks, and many other skills you can't learn very well on your own. Bruce has a deep respect for the animals and the land, and we have a tremendous respect for him. For those of us who weren't lucky enough to learn from a family member, this was a great opportunity to start to gain the practical skills necessary to build confidence and enjoy the hunt in a safe, ethical way.